Way back in January, 2013, I began having some very serious eye problems. I had a friend visiting and as he was talking to me I saw his face change… first of all he had 4 eyes, 2 noses and 2 mouths… and then it turned into two heads. Pretty scary when you don’t know what is happening to you. That happened a second time when he visited. So I made n appointment with my Doctor. 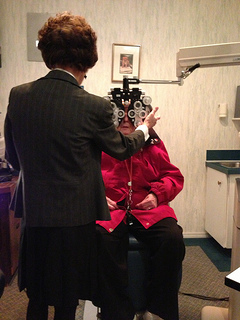 He referred me to my ophthalmologist… and I waited a month to get in. She is a very talented doctor and both my husband and I have gone to her. She thought I might have Temporal arteritis, but after some tests she found that was not the case.Then I had to have a temporary prism on one lense and wear it for a month. That didn’t help, so she referred me on to another specialist. This time the doctor said I needed new glasses, especially the left eye… and my new glasses should be ready in one more week. Yeh! It has taken 6 months to finally get new glasses. I just got a call on my answering machine to let me know my glasses are ready to pick up! What a great surprise after being told it would take ten days. Guess where I’m going tomorrow? Glad you found out what the problem was. Good to see you here, Bev. Thanks for dropping by. I can see better… but the problem (double vision) is still with me! MAybe I just have to wait until my brain gets used to the new lens. Hi Heather! Thanks for dropping in this morning… maybe I just have to wait a while ’till my brain clues in….I see better, but the double vision is actually worse. Yes, it can take several weeks to adjust to new glasses and prisms are out of the ordinary. My prayers are with you, hang in there, my dear. yep! That’s why you looked so good! Guess I should appreciate the double vision! thanks for stopping by, Dayle. Love, Auntie Norma. Mornin’ Kallie. Yep… I am seeing better, but still have the problem of double vision! Thanks for your visit. It is much appreciated. Finally! I hope the wait will be worth it and the new glasses will fix your double vision for good. Mornin’ Carol! . you already know the outcome… Maybe I just have to wait a few days ’till I get used to the new lens.Thanks for coming by! Praying for a good outcome with the glasses. Vision is so important to an artist. Good mornin’ Judith. Thanks for your prayers, and keep them going, please. I see better, but the double vision is still with me. Maybe I just have to wait until my head gets used to the new lens. Sure is good to see you here. I do appreciate your friendship. Good morning, Terri McGuire. I am sorry that you no longer enjoy my blog and have asked me to unsubscribe you. That is out of my hands, and it is impossible for me to do that. You are hooked into this family for LIFE! And I am GLAD! Thanks for dropping by! please let me know it you re “Terri McGuire”. or “Terry” McGuire. I know 2 Different McGuire’s by that name… both spellings. Unless there is another Terri McGuire in the family that is not Terri ( Gary ) She is quite confused . I remember having difficulty walking after getting new glasses be cause the ground looked farther away than it actually was. People probably thought I was drunk those first few days 🙂 Have a great day !